write, edit and proofread a short fiction story. This resource is also relevant to Media Studies- Audiences, History of media forms, Representations in news, Media production and Codes and Conventions of news media. Describe the sequential order of the archival video’s camera shots, and the story the images tell. 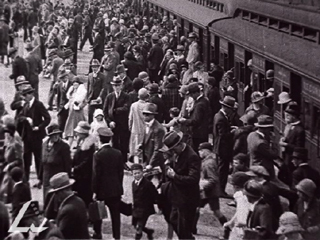 Time the running length of the 1926 Royal Melbourne Show video clip, then plan and draft a script for it, as though it were a voiceover description to be delivered by a narrator. Make sure the narration suits the on-screen images, and that its running time is no longer than the length of the video clip. Practise reading it out loud within the time limit, then deliver your narration to your teacher while the newsreel is screening on the computer screen. An alternative may be to record your narration, with a suitable music soundtrack, which can be used during pauses in the commentary, so that it may be played simultaneously on cassette with the video. Write, edit and proofread a short story comedy about two rival newsreel teams trying to film the same event. Examples may be the airport arrival of a famous movie star, the Melbourne Cup, or a fashion parade of 1935.